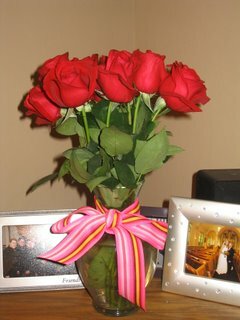 The picture is of the gorgeous flowers that my wonderful husband gave me for my birthday on Monday. They were very sweet and it was a great birthday. We went out to dinner on Sunday night and Monday night I went out to dinner with some girlfriends and Lindsay, my sister. My favorite part was the card that Mike gave me from the baby with the cutest note inside, from the baby of course. I started crying, of course. (: It is so crazy to think next year on my birthday I'll be a mom!